Between November and December last year, 38 million tweets were sent about Christmas in the UK alone. Christmas food, Christmas TV and films, Christmas traditions, Christmas trees and decorations, that Christmassy feeling, Christmas wrapping paper, Christmas gifts, Christmas shopping, Christmas ads. You name it - if it was about Christmas, it was probably tweeted. Why is Twitter so great at Christmas? Because it's the perfect medium to interact with people across the globe in a quick and easy way. Unlike other social media channels, it enables users to have an ongoing and inclusive conversation - usually about global issues or celebrations - in a seamless, straightforward fashion. And so, if your marketing team was thinking of sidelining Twitter this Yuletide, think again. Whether you're a retail giant or small, independent store, here are four ways all you ecommerce marketers can make the most of Twitter come November. The elves over at Twitter HQ certainly have been busy over the past 10 months. Get creative with (Promoted) Twitter Stickers: Just a few months ago, Twitter introduced rotating sets of stickers which could be used to make users’ photos more exciting. You can stick as many stickers as you want onto your photo, as well as resize and rotate them. At the moment, our favourite festive stickers are Mr and Mrs Claus, but let’s see if Twitter listens to our request for a pud! 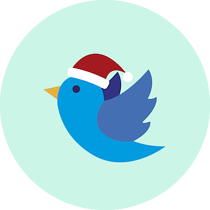 You can use Stickers to jazz up any Christmas related Tweets you send; for example, an image announcing a new festive collection, or just to wish all of your followers a Merry Christmas. As well as using Stickers to embellish tweets, brands also have the option to create promoted stickers (reminiscent of Coca-Cola’s paid brand emoji last September for its ‘ShareaCoke’ campaign). According to a Twitter blog post from August, brands have the option of designing four or eight stickers. The Stickers act as a “visual hashtag”, so that photos with your brand’s sticker will be “connected and discoverable to anyone who taps your brand’s sticker”. Pepsi was the first to buy a sponsored sticker, sharing almost 50 customer stickers across 10 markets. Promoted Stickers are available to “select marketers” with a managed account; Twitter has recommended contacting your account team to learn more. We’re not sure about the exact amount you’d have to dish out to get your own stickers, but rumour has it it would be “at least $500,000”. More information on how to apply for sponsored stickers here. 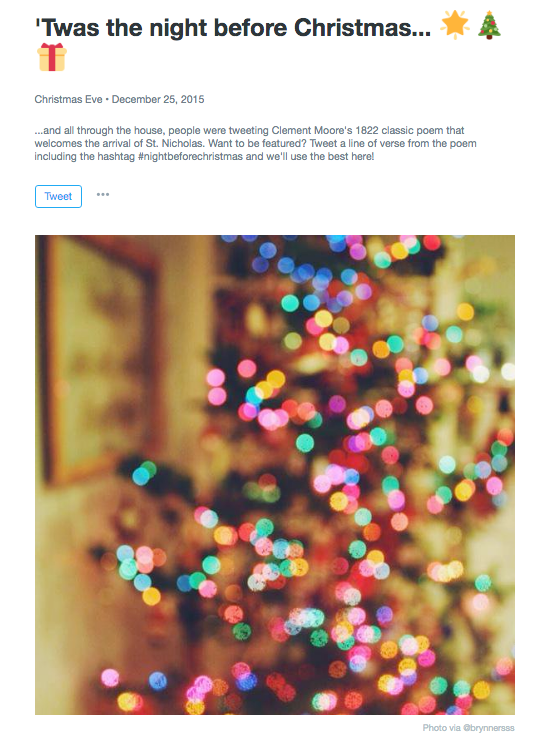 Tell a story with Moments: It’s October, but Christmas jumpers are already appearing on Twitter Moments - ones designed by Whoopi Goldberg, in fact! If you’re late to the (Xmas) party with Moments, they are basically a series of tweets brought together to tell a story in a quick way. The aim is to enable people, companies and brands to curate stories based on different topics/subjects. For example, last year Twitter asked the public to contribute a line from Clement Clarke Moore's famous poem The Night Before Christmas and then handpicked the best ones. 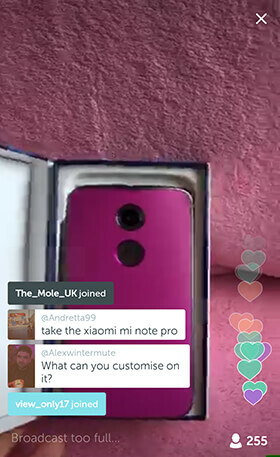 Go live on Periscope: Secret santa in the office? Ice-skating outside your brick and mortar store? Have a new product you want to showcase? Consider capturing Christmas in real-time with Periscope - Twitter’s live-streaming video app. For some first-hand inspiration of ecommerce brands using Periscope, check out this Shopify blog post. As pointed out in the article, Periscope is a useful tool for making your brand more transparent, which in turn can deepen customer loyalty. Promoted Video (which enables you to post material your followers can watch with a “single tap”) comes with “robust targeting options” and cost per view pricing (i.e. you only pay when someone clicks ‘play’ to watch your video). According to Twitter, its users are far more open to advertising during the Christmas period, with 57% remembering festive branded hashtags after the Christmas period, and 7 in 10 looking forward to Christmas ads this year. 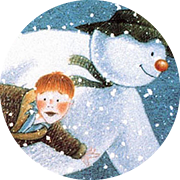 Retailers to have nailed Christmas ads and videos thus far include Sainsbury’s, Coca-Cola and, of course, John Lewis. Last year, the department store’s advert - #ManOnTheMoon - garnered 303k tweets. Tweet-twoo. If your brand doesn’t have its own ad, think about starting a rapport with your followers about ads you like and why. It’s all about just getting involved with your customers, and not coming across like a bit of a scrooge. Last year, Twitter saw 250k tweets about Christmas ads on 6th November, and 10k tweets just over a week later for the annual turning on of the Christmas lights. And then there’s Black Friday - the unofficial start of Christmas shopping fever. Last year saw 625k tweets about Black Friday and 60k tweets about Cyber Monday later in the month - get on it, guys! If you don’t do anything else this Noel, jump on board with some of the most Tweeted about Christmas topics. That Christmassy feeling: 12th November is the biggest day for excitement and ‘can’t wait’ tweets. Advent calendar: Expect over 100k tweets mentioning advent calendars on the 1st December. Could your brand create its own 25 day count-down, giving out free gifts? Christmas trees: This will be a big topic for homeware/interior brands. Last year, the peak day for putting up a Christmas tree was 6th December. Food and drink: If you’re an ecommerce company selling food or drink, you’ll have Christmas hashtags on-tap. Last years favourites ranged from #IdealMeal to #toblorange. Christmas TV & movies: Join in the conversation, angling it to make it relevant to you. For example, a spot the difference between a coat in War and Peace and a cape from your A/W16 collection. Present wrapping: Perfect for brands selling stationary! There were around 33k tweets about wrapping on Christmas eve last year. #JoinIn: This campaign aims to bring those alone at Christmas together on Twitter, started by comedian Sarah Millican. It may be on the brink of being sold, but that doesn’t stop Twitter being one of the most important marketing tools available today. Whether you choose to go all out and create how-to Christmas recipe videos, or keep it low key with the odd festive meme, Christmas is a great opportunity for retailers to reach out to their consumers during the most wonderful time of the year.